This corn gets grilled and slathered with an amazing mayonnaise blend and topped with parmesan cheese and chili powder. This is one of the best corn recipes you will eat! I can’t believe that I haven’t tried it until now! This was the best corn that I have EVER had! The corn grills to perfection on the grill along side of the meat that you are cooking. As soon as it comes off it gets slathered in a mayonnaise and sour cream cilantro mixture. Then it is topped with parmesan cheese and chili powder. All of these flavors combined were incredible! We all couldn’t get enough of this corn. My son had two! 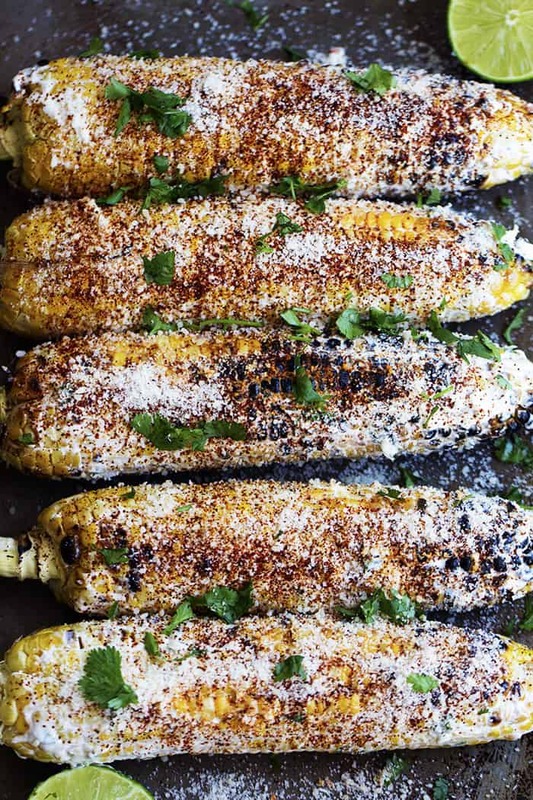 I could see us making this corn at every single BBQ from now on. It is just that good! I know that you guys are going to love it as much as we did. Remove the husks of the corn leaving the core attached. Grill the corn turning once on a hot grill or cast iron pan until it starts to get slightly charred. In a small bowl mix the mayonnaise, sour cream and cilantro. 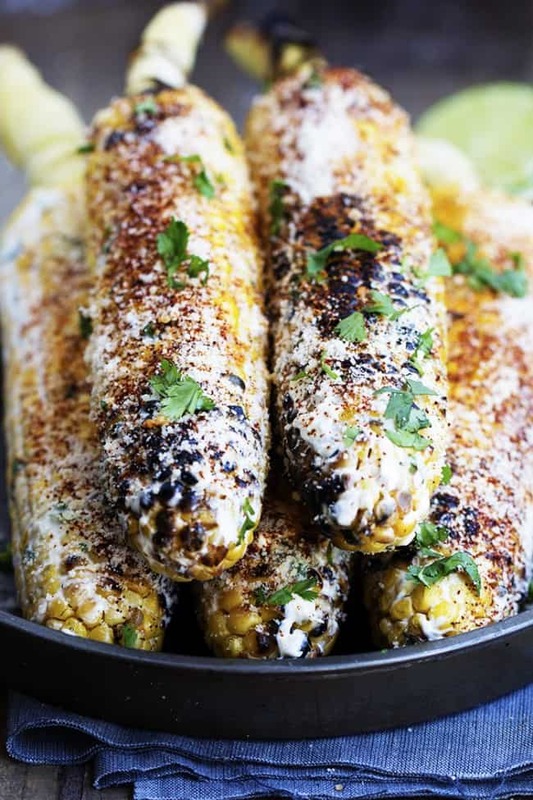 Remove the corn from the grill and slather with the mayonnaise mix. 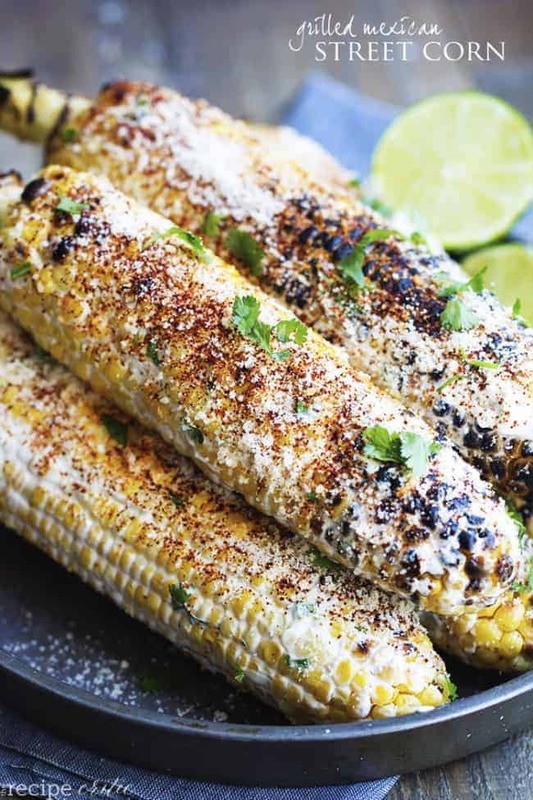 Squeeze the lime juice over the corn and heavily season with parmesan. Sprinkle with chili powder. I will try to cook this on the weekend when I have more free time. It will be great for outdoor cooking in my garden. Thank you for sharing this amazing grilled Mexican street corn recipe with us. This recipe is delicious! However, there was enough costing for 8-10 ears of corn! It needs to be scaled down or the number of ears increased.